This recipe has been waiting in the recipe box for a while. A little longer than it probably should have because it is so good. SO GOOD! Confession: I made this and didn’t share with Ryan. Well technically I feel off the hook because I made it gluten free so I would be able to eat it. And we kind of have this unspoken rule that if I make a baked good with gluten free flour it’s all mine. 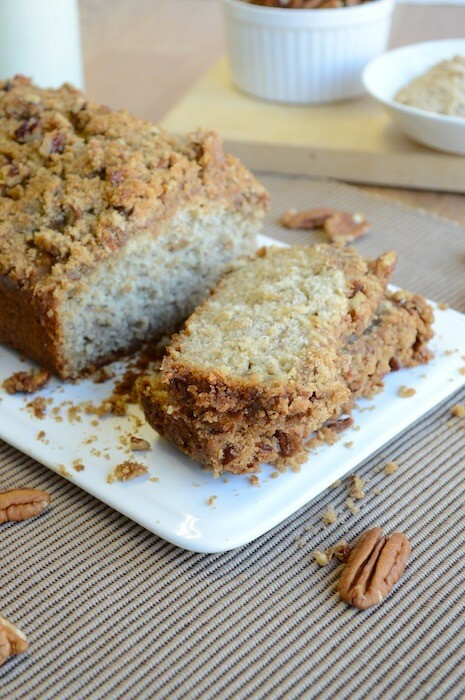 Let’s give sympathy to the gluten free girl and let her eat the entire loaf of banana streusel bread. Just gaze at that streusel topping! 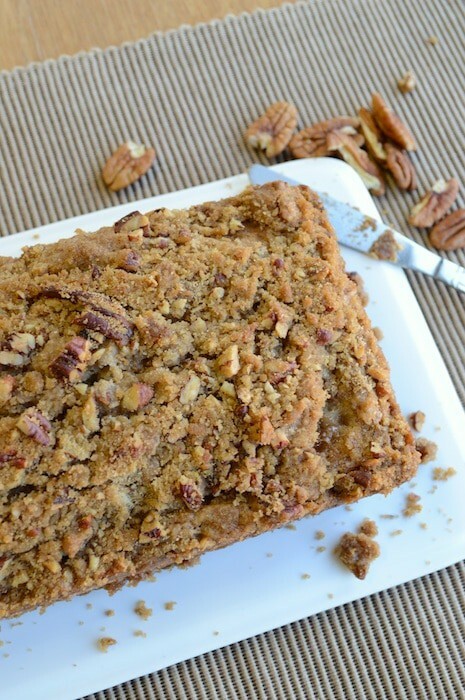 Brown sugar, cinnamon and chopped pecans – sounds like it’s own dessert! Grease and flour a 9×5 inch loaf pan; set aside. Prepare the streusel: In small bowl, stir together the brown sugar, flour, and cinnamon. Using your fingers, cut in the butter until mixture resembles coarse crumbs. Stir in chopped pecans, then set aside. In large bowl, beat together bananas, sugar, butter, eggs, and vanilla. In separate bowl, whisk together flour, baking powder, baking soda, and salt. Pour the flour mixture into the banana mixture, and mix. Dump the streusel topping on top of the batter, slightly pressing it into the batter. Bake for 60 to 70 minutes, or until a toothpick inserted in the center comes out clean. Let the loaf cool in the pan for 15 minutes, then remove it from the pan and cool completely. This looks so good! 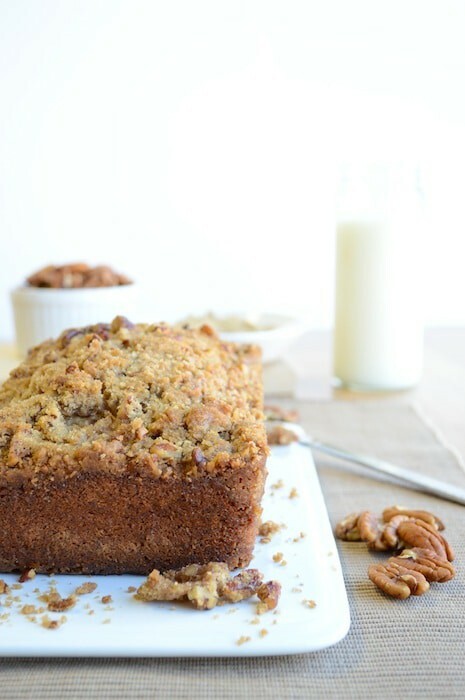 I love banana bread of all kinds, and I bet the streusel topping makes it extra special. I’ll definitly have to keep my eye out for any of my bananas that are getting a little too ripe. Or speed up the browning process and put them in brown paper bag overnight! In a brown paper bag-fun tip!! Yeah! It should help speed up the process! I shared it there too! I almost gave up on making Cinnamon Streusel Banana Bread. I had tried several different recipes that sounded really good, but was disappointed with how they turned out. They were okay, but not nearly as good as I thought they would be. I decided to make one more attempt. I searched again and found this recipe at Canadian Living. I’m not sure why this particular recipe caught my attention, because I’m usually drawn to recipes that have photos–and there wasn’t a photo shown with this one. But for some reason, I decided I needed to try this out, and I am so glad I did! I am glad we both found it! It really is delicious. I have 3 bananas that are ready to be used for this awesome bread! YUM! Love the struesel topping on this one Beth! Pinning, and thanks for sharing at Show Stopper! Oh those bananas will be so happy in this bread! Enjoy!! I am so making this!! I love banana bread and since we never seem to finish our bananas before they get brown, I make it a lot. 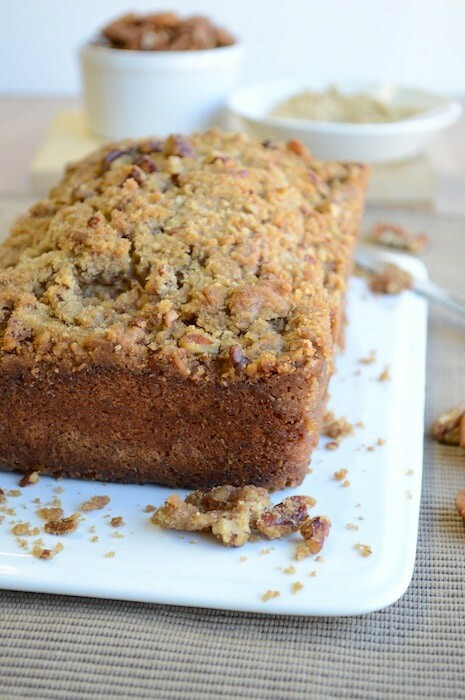 It sounds AMAZING to have a streusel topping on banana bread; I can’t wait to try it!! Haha, our bananas seem to go brown too Brooke! This looks amazing! I’ve added streusel to banana muffins, but never banana bread. What a great idea! 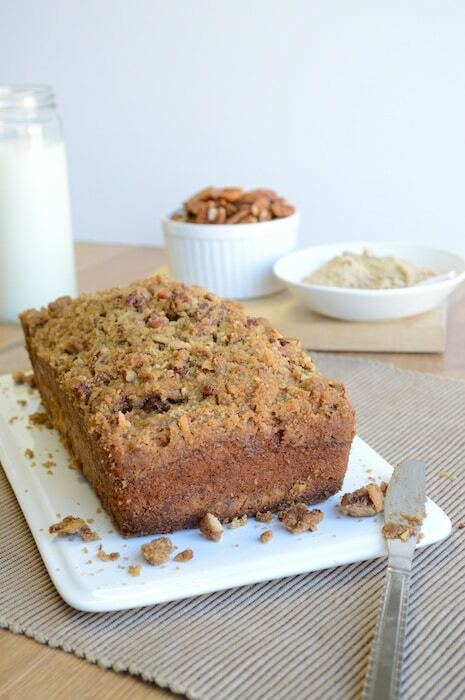 Adding streusel to anything is a good idea :-) Thanks for coming by! This looks so good. Thanks for sharing on Foodie Friends Friday! Have a great Sunday Michelle! Beth, this looks delicious! So nice to have gluten free recipes around! I am pinning for later. 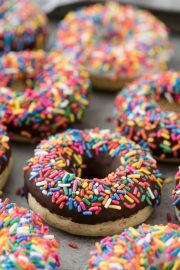 Also, I am going to feature your recipe this week…I know our readers from Family Fun Friday would really enjoy it! Thank you for linking up! Hi Beth, thanks for sharing this recipe with us at Marvelous Monday tonight… will be pinned to my MM board! Haha I agree! Thanks for coming by Angela! It is definitely worth a try! Enjoy Sarah! I am the same way! Have a great Tuesday Kelly! Looks fantastic Beth!!! Thanks for sharing your delicious nibbles at WONDERFULLY CREATIVE WEDNESDAY!!! Thank YOU for hosting Nic! 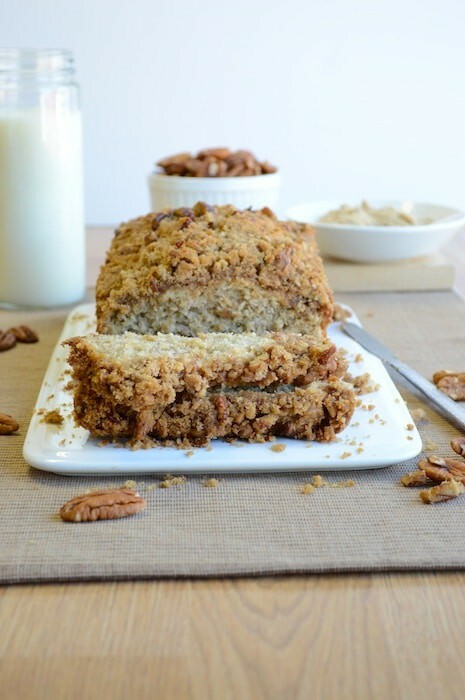 Yum, I love banana bread and I bet it only gets better when you add streusel! So glad you shared this at Creativity Unleashed, cuz I am definitely pinning this! Sounds like we all LOVE streusel! Yum! 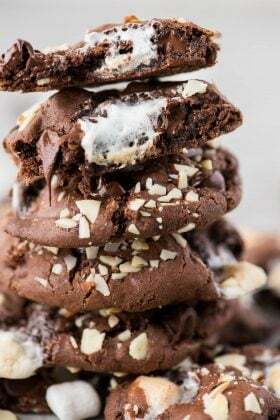 I came across your blog via pinterest and this looks amazing! 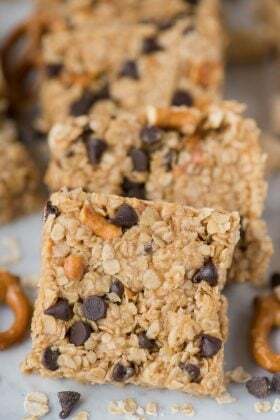 I’m new to baking gluten free (my nephew just found out he’s allergic) and I want to make this. 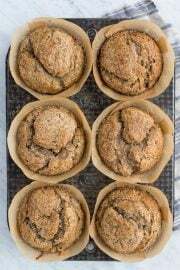 What do you recommend instead of all-purpose flour? I’ve tried a few different gluten free flours and have not been fully satisfied. Thanks! Also, do the measurements remain the same? Hi Melanine! I use Andrea’s Gluten Free All Purpose Flour based in St. Louis and it is a one for one substitution. Pamela’s is a large brand which you could probably find in a store near you – but I think it’s important to try out different brands to see which you prefer. I hope you can find something that works! What a great way to use those ripe bananas, Beth! Pinned – Thanks for linking up to Freedom Fridays! 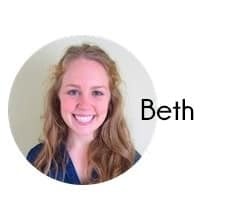 Hi Beth – This bread looks so beautiful and delicious! Thank you so much for sharing with us at Best of the Weekend! Pinned and I will be featuring it at tonight’s party! Hope you have a happy Friday and thanks again so much! Cindy, I appreciate you sharing this very much – thank you! Oh, how delicious your bread looks! 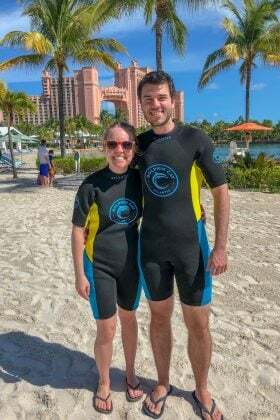 Thanks for linking p at Family Fun Friday! Have a grand Saturday Sarah! 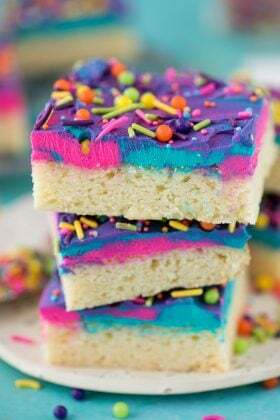 Oh my goodness, this looks so delicious. 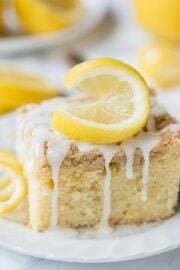 I need to make some asap! I’ll be featuring this on my blog tomorrow. Thanks for linking up to the Block Party! Just finished our loaf. It was great!! Thanks for the recipe. Hi Sue! So glad you enjoyed it! Thanks for letting us know! Stumbled and pinned. This looks amazing!